Editor's Note: This 3 part analysis was originally completed in May 2014. I have only changed some formatting to post them on this blog (nearly 3 years later). To be truthful, I allowed my missed interpretations to stand, in open view, along with the ones that have held true through today's posting (which just happens to be a few days following President Trump's killing of the GOP's initiative to repeal and replace the Affordable Care Act). I owe so much gratitude for the support of Penny Farrow and the late Sri Purna in writing this article. While I started with a simple review, they both pushed me to leave no stone unturned. The Founding Fathers of the United States appreciated the importance of inaugural timing. Benjamin Franklin played an integral role in defining when to sow the seeds of a new nation. Franklin made his fortune through publications of Poor Richard’s Almanak (sic, farmer’s almanac). He personally calculated daily planetary positions and used the information to predict draughts, floods and determine proper planting times for crops. Poor Richard’s was second only to the Bible in sales during its publication years. Franklin was instrumental in setting the signing date for the Declaration of Independence. He fully understood that an ordinary time would not suffice with the fate of a new country on the line. One could say he selected a pretty good time. Jyotish fully embraces the concept of starting activities at the right time and place as a means of promoting desirable outcomes. Muhurta is the electional astrology limb of jyotish, used to pick optimal starting times for the success of any enterprise. We all have good days and bad days but, a good muhurta provides an ideal time to begin an important activity. In this article, I will present a muhurta view of President Barack Obama’s effort to implement the Affordable Care Act, the national health insurance legislation more popularly called Obamacare. It has been a rocky road for the first four years of Obamacare. Even with a Democratic controlled Congress, the legislation faced monumental obstacles and controversy prior to its signing. The onslaught of challenges continued to escalate during the three years of preparation for its operational implementation. The government's enrollment website was fraught with fatal errors. The Republican led House of Representatives voted over fifty times to repeal or amend the law. Republican state governors have refused to accept the federal money provided by the law to extend Medicaid healthcare benefits to millions of their poorest uninsured citizens. Prominent government officials openly encouraged young Americans to break the law by not signing up for an insurance plan. Conservative politicians and media have maintained non-stop outrage and criticism of the law, encouraging a negative public perception. A muhurta chart and its pertinent panchangam data (astrological almanac) must be assessed in relationship to the success already inherent in the native’s birth chart. Even a great muhurta time selection will not provide kingly rewards for a pauper. 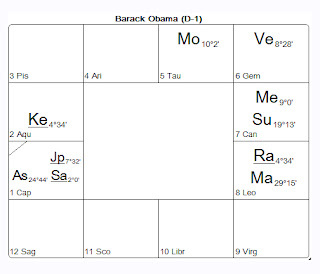 In this analysis, we will look at the President’s natal chart to qualify how likely he was to "successfully" execute such a controversial program. This includes evaluating his natal chart to see if it was a good time for a fruitful implementation. After understanding the President's chart, we’ll be in a good position to review the muhurta chart for the signing ceremony. The muhurta should show whether the heavens were positioned to emphasize the strengths or weaknesses present in the President's chart. It should clarify whether or not the program will experience long term success and whether the public will ultimately embrace or reject the legislation. President Obama’s birth time is readily available from his birth certificate published on the White House web site. He was born at 7:24 PM on Friday, 8/4/1961 in Honolulu, HI[i]. President Obama's two term presidency already confirms he has extraordinary character makeup and the providence required for large scale success, but does his natal chart reflect the historical facts? In jyotish, the evaluation of a native starts with the condition of the lagna (1st house) and the lagnesha (1st house lord). They are the primary indicators of personal strength and success. Obama's 1st house of Capricorn is occupied by its own lord, Saturn. A planet occupying its own sign is conditionally strong. My teacher (Hart deFouw) created the term "First Tier Strength" (FTS) to describe conditionally strong planets. (See Exhibit 3 at the end of this blog for the complete list of planetary strengths.) Saturn is retrograde which makes it brighter in the night sky (its orbit being closer to the earth). From a Jyotish perspective, retrograde planets are viewed as having strength. Natural benefic (NB) Jupiter also occupies the 1st house associating with Saturn while NB Mercury aspects Saturn. NB that associate with or aspect a planet creates a "Second Tier Strength" (STS) which shows the addition of minor stabilizing and positive conditioning effects. Combining these effects, we can conclude that the 1st lord Saturn with two FTS and two STS is overall very strongly conditioned and stable. A true planet like Saturn, located in its exalted or own sign while being in a Kendra (Angle), forms a Pancha Mahapurusha yoga[ii]. Yogas are either auspicious (or inauspicious) planetary placements and combinations for fame, wealth, success and power (or the lack thereof). Yoga combinations separate ordinary destinies from the extraordinary. The fact that Saturn is the lagna lord itself in an angle house, upgrades it to raja yoga status. [iii] A raja yoga (great or kingly yoga) is considered significantly more auspicious than an ordinary yoga. Saturn’s association with the NB Jupiter in the 1st house combined with friendly NB Mercury's aspect creates Chamara yoga[iv] for the 1st house itself while simultaneously generating a second raja yoga for Saturn[v]. 1st lord Saturn’s mutual aspect with the 9th lord Mercury forms a Dharma-Karma Adhipati yoga[vi]. Finally, Saturn is positioned in the same sign of the natal chart and of the panchamsha (5th divisional chart). This creates yet another Saturn raja yoga[vii]. All four of Saturn's yogas should be viewed as having a cumulative effect. 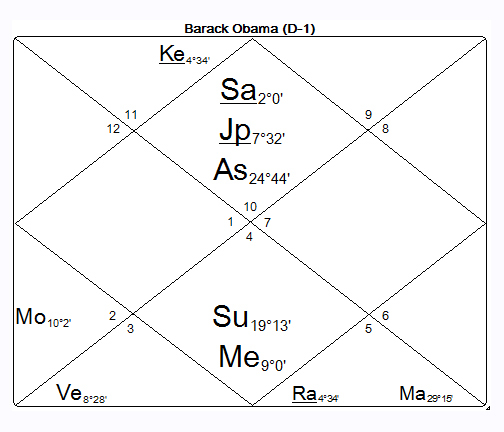 Without a doubt, Obama's primary planet (Saturn) is very strongly conditioned while participating in multiple yogas. Its placement is “off-the-charts” strong. 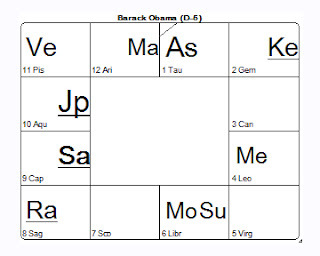 Jupiter's mixed condition and placement in the 1st house foretells that Barack Obama was fated to overcome inherent weaknesses, turning them into great strengths. Jupiter has "First Tier Weakness" (FTW) from being debilitated in the 1st house of Capricorn. Jupiter is FTS retrograde and has FTS digbala (directional strength) based on its 1st house occupation in the East. Jupiter's association with his dispositor (Saturn) in an angular sign converts his debilitation into a Neecha Bhanga raja yoga[viii]. This raj yoga is replicated an additional two times, first by Saturn (lord of the depression sign) being in an angle to the lagna and secondly by Mars (the planet that is normally exalted in the depression sign) being in an angle to the Moon. Jupiter as the debilitated 12th lord occupying the lagna, directly implicates him in a fourth raja yoga[ix]. The two FTS place an exclamation mark on the potency of all of Jupiter's raja yogas. Having established the fact that Jupiter is quite strong, we can properly appreciate the vigor of its involvement in the rare Gauri yoga[x] where Jupiter aspects an exalted Moon in a trine house. With this truly splendid Gauri yoga, Jupiter completes a great leap, joining Saturn in “off-the-charts” status. It is rare to find individuals with such a strongly conditioned 1st house and lord. The quantity and quality of yogas involved are extraordinary. This is a destiny pattern of a highly self-assured individual who will experience great fame and success in his life. One could justifiably say that the nearly unlimited potential meanings from four planets and eight houses can be "cherry-picked" to match historical fact. This is true to some extent in any astrological analysis. It is the astrologers' job to filter out the relevant interpretations. For example, I did not chronicle the 3rd house meaning of "siblings" or the 7th house meaning of "marriage" since they are not pertinent to the subject. The key is that the above topics are all powerfully linked to the 1st house and 1st lord, while participating in multiple yogas. The importance of attention warranted by the 1st house and 1st lord in all readings cannot be overstated. This suggests the native will be extremely diverse and excel in many arenas. This is expected for the leader of such a broad topic as national healthcare reform. Together they compose a chorus waiting to be heard across the land "at the proper time." In contrast to the strengths presented so far, all is not rosy for Obama. There are multiple troubling conditions in his chart. Most outstanding is the lords of all four dussthanas (houses of misery: 3rd, 6th, 8th and 12th) either occupying, associating with, or aspecting the 1st house and 1st lord. They form a cornerstone natal chart representation for President Obama's struggles in life. 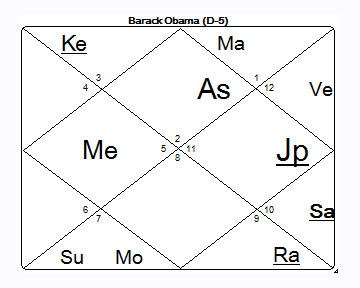 Obama's 10th house (career and fame) reveals major difficulties with the inauspicious Dur yoga[xi] (10th lord Venus occupies the negative 6th house while the strong NM Saturn aspects the 10th house). This is indicative of why many Americans view him as a foreigner and a traitor. The President won his first election during his Jupiter dasha, Moon bhukti. Dashas are expansive life periods between 6 and 20 consecutive years when a planet moves to the foreground, exerting its full strength to account for the promises it foretells at the time of birth. 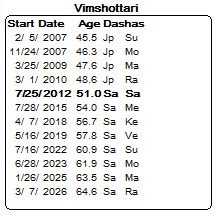 Bhuktis are subordinate dasha periods between 3.5 and 40 months long. Obama's Jupiter clearly had the extraordinary strength required to negotiate health care reform legislation during its dasha rulership. Moon, as the 7th lord (partners) is located in the 5th house (congress). Jupiter aspects both houses and the exalted Moon forming the Gauri yoga. This formation was wholly activated during Obama's Moon bhukti, signifying his presidency would begin with gains from very strong partnerships. In this case, he had Democratic control of the Senate and House to push legislation through for his signature. Obama began his 19 year Saturn dasha three months before his 2012 re-election. Obamacare was already signed law but, it was far from being fully enacted. As previously discussed, his Saturn is extremely strong. His raja yoga 1st lord Saturn shows that he has the fortitude to follow through to a successful execution. This will be more evident during his final seventeen months in office when he is in his Mercury bhukti (starting in late July 2015). Saturn's yoga with Mercury, lord of the 9th house (good fortune) who is residing in the 7th house (partnership) reveals that he is due to once again enjoy the support of partners. His Gauri yoga will not be so strongly activated as it was during his Moon bhukti, but it will exert some influence. This should result in an increase of legislation reaching the President's desk for signature. The political situation will likely change, making it more beneficial for the Republican Congress to negotiate with the Democratic membership. 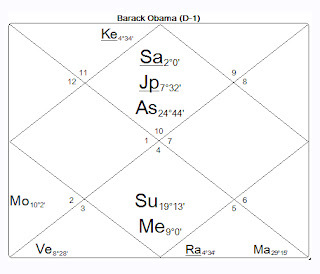 As the key instigator, Saturn's dasha is activating Obama's 10th house Dur yoga problems. This has been especially apparent with transiting Saturn occupying the President's 10th house (Libra) from November 2011 through October of 2014. The effects were not great enough to deter his re-election bid, but clearly reflected his overall drop in popularity. The Dur yoga's effects should slightly ease up following the 2014 mid-term elections with Saturn moving into Scorpio. The nature of these various stars color the fundamental constitution of the native’s life. Their traits are especially heightened during their dasha. President Obama’s Ascendant is in the star Dhanishta. People with Dhanishta prominent in their chart are noted for pioneering and trailblazing. They are often involved in governance, medicine and surgery. Even though their intentions are good, they are commonly mis-characterized. This does not stop them from staying focused and moving forward, while keeping a clear mind on their objectives. President Obama is a government official who is blazing new trails regarding the laws of the land affecting medical care. Despite relentless distractions and naysayers, he has maintained an even keel and remained focused on the goal. The President’s 1st lord Saturn is in the star Uttara Ashadha. Natives who are noted for their physical and mental penetration, are commonly linked to surgery and deep thinkers. They are patient, forbearing and often have careers in politics or health care. Uttara Ashadha is associated with the Hindu elephant headed God Ganesha, who is known as the remover of obstacles. They have a skill for starting large new enterprises and following them through to completion. The President has exemplified these traits while deftly navigating tremendous obstacles to Obamacare legislation. The President’s Moon is in the star Rohini. Natives are highly charming and are known for providing and receiving good hospitality. They exhibit an ability to start and grow new ventures. They will climb the success ladder and be propelled to high positions in society and career. They are good at eluding obstacles, can be obsessive about life and death issues and often experience strong racial tensions in their life. They commonly involved in plagiarism of ideas or property, both as perpetrators and victims. Rohini’s nature shining on the President's life and success is obvious. The previous paragraph reads like his personal bio, but the extent of plagiarism found in his recent life might not be so clear. His signature program was designed to be nearly a direct copy of Mitt Romney’s Massachusetts health care program. Outlandish conspiracy theorists continue to claim the President's birth certificate has been faked. They have altered his family history, encouraging a large population to believe he was born in Kenya. This misguided information has been used in never-ending attempts to discredit him and his legal right to be president. In summary, President Obama’s chart robustly reveals his intention and capacity to legislate major health care reform during his presidency, albeit with significant problems. Much of his success has already proven true but, at the time of this writing, widespread resistance remains. The questions are, "Was the bill signed at a time that helped or hurt its success?" and "How will it fare long term?" In Part 2 we will examine the muhurta for Obamacare’s signing ceremony. [xii] Exact degree of the rising sign which provides the most unique descriptor for the native in a chart.